We had a bit of a problem back home while we were at Pennsic, and Lynne (and Lackey) helped us out. Since She wasn’t at pennsic, but had gone many times in the past, I wanted to get her something that would be special but that she wouldn’t have already. Wandering off on my own on Wednesday night I spotted some yarn that jumped out at me and said, this is what you are looking for! So I decided to make her a belt on one of my hand made looms. I used a belt buckle that I had picked up at Gulf that was hand cast. 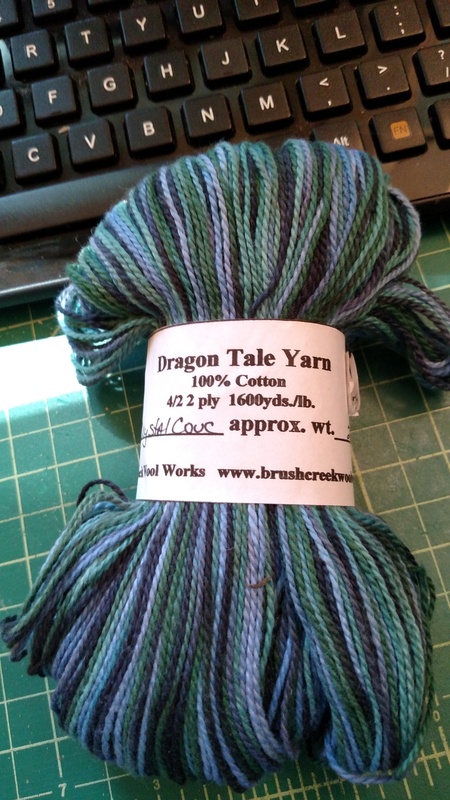 The yarn is cotton Dragon Tale Yarn. 4/2 2ply 1600yds/lb Crystal Couc? – 2 ounces from my favorite vendor at Pennsic: http://www.brushcreekwoolworks.com/ As I said to them this year, if I were to merchant, this would be my shop as it has nearly everything I love. 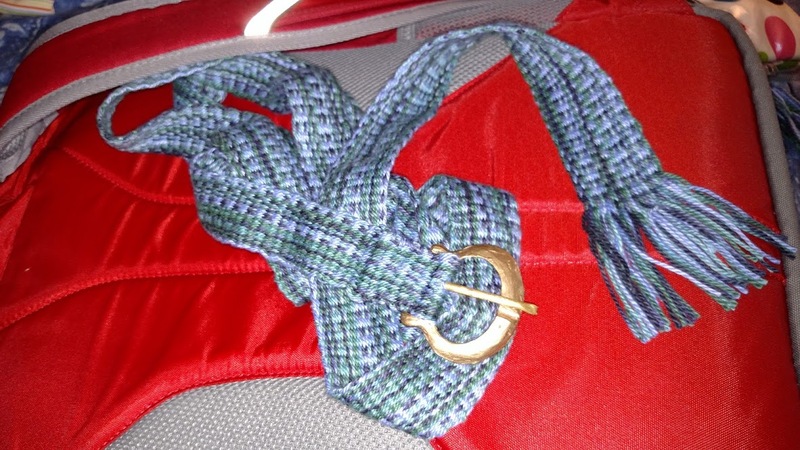 Total time to make the belt – well I bought the yarn on Wednesday night, didn’t start working on the belt until after teaching my class and hanging out with Beth, so Thursday evening until I ran out of light and then Friday when we weren’t disassembling the camp, I was working on this. I finished weaving it when we ran out of light on Friday. I sewed on the metal bit when I got home.